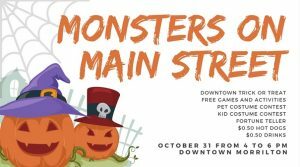 Main Street Morrilton will present the 21st Annual Monsters on Main Street Halloween celebration in Downtown Morrilton. Local businesses and organizations will provide tricks and treats for local kids and adults alike during this annual community event. Downtown trick-or-treat is from 4 to 6 p.m. Participating businesses and organizations will be set up in front of downtown store fronts with treats. Food, games and entertainment will be at various locations including the Morrilton Depot Museum, Conway County Courthouse parking lot and in the Broadway Pocket Park. There will be a pet costume contest on Railroad Avenue starting at 4 p.m. A costume contest for kids 18 and younger will take place in the Rialto Theater at 6 p.m. The event is free to the public and everyone is welcome. Hot dogs and drinks will be available for purchase for 50 cents each. Main Street Morrilton is dedicated to promoting Downtown Morrilton as the hub of community life, to instilling a spirit of community through various events and to promoting historical awareness, preservation and renovation. For more information, follow Main Street Morrilton on Facebook or visit mainstreetmorrilton.org.